Efficient management of space resources is one of the main factors of prosperous economic development of an area. Technological development enables an integration of attributes linked to space, creating a spatial informational support for increasingly more complex social communities. An important component of these systems is mass real estate valuation, especially in urban areas. 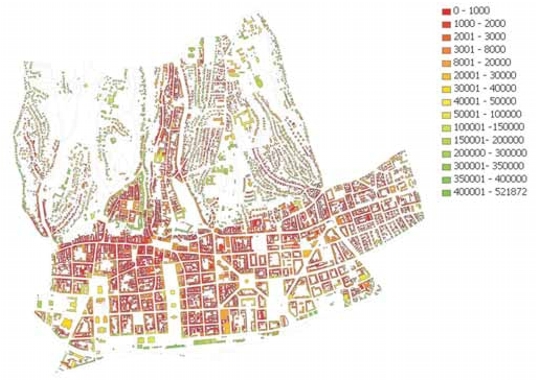 The paper explains data modelling and storage of a 3D test area space model into a spatial database and describes a procedure of visibility calculation as a real estate valuation factor for a part of the City of Zagreb. In the paper, visibility is presented as a visibility polygon, a two-dimensional geometric shape drawn by intersecting a continuous visibility border in all directions from the object weight centre, considering the intersection of horizontal vision and obstacles. A matching visibility polygon is attached to each building in the whole test area, under the assumption that the polygon area can be correlated to a positive or negative influence on real estate value. The speed of the visibility calculation function in the test system was measured.